2014 Crestwood Women & Families Fund grant recipients: Deborah & Larry Ward, Inside-Out Ministries; Patrick Wynn & Beth Morring, Boys & Girls Club of North Alabama; Ginger Finzel & Eugenia Graves, Community Free Dental Clinic; Venus Tomlin & Ann Anderson, CASA; Stacey Johnson, Hospice of Marshall County; and Michelle Skelton, The Care Center. 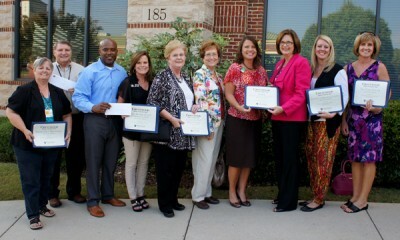 Crestwood Medical Center and the Community Foundation of Huntsville/Madison County recently held a Founding Supporters Celebration and announced the organizations who received grants from its first distribution from the Crestwood Women & Families Fund. The mission of the Crestwood Women & Families Fund is to establish a grant-making fund for high-impact grants to address the issues and meet immediate needs of women and families in our community. The fund is managed by the Community Foundation and represents the first “giving circle” managed by the Foundation. More than 100 donors contributed $20,000 to the fund in its initial campaign. These Founding Supporters and honorees were recognized on commemorative displays placed at the Crestwood Women’s Center and in the Café of the main hospital building. Not-for-profit organizations in the community who serve women and families were invited to apply for grant funding by following a formal process. An Advisory Committee consisting of members of the Crestwood Women’s Advisory Council, Crestwood Medical Center employees, and volunteers met to review applications and recommended grants to selected organizations. Those interested in contributing to this fund to continue supporting organizations in our community who assist women and families should mail their check made out to the Community Foundation and mail to P.O. Box 332, Huntsville, AL 35804. Please indicate Crestwood Women & Families Fund in the memo portion of your check..
on Wednesday, 01 October 2014.